Cape Flats stands in solidarity with New Zealand after terror attack - SABC News - Breaking news, special reports, world, business, sport coverage of all South African current events. Africa's news leader. After prayers a human chain was formed to show the unbreakable strength of the human spirit, a triumph over evil. 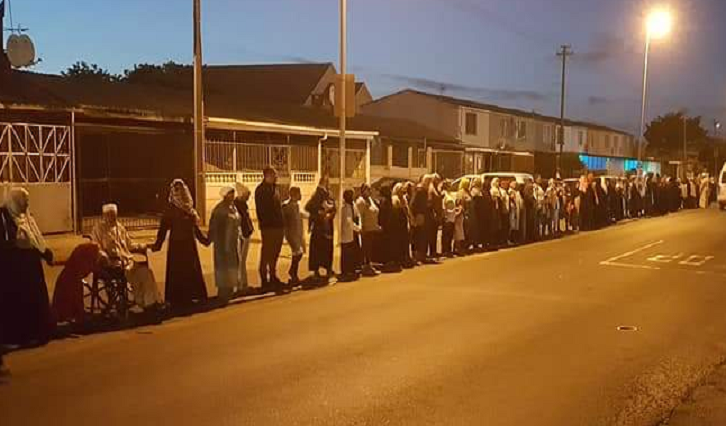 As New Zealand held a day of reflection and mourns the death of 50 people in a terror attack a week ago, the community of Bonteheuwel on the Cape Flats quietly showed their solidarity. During afternoon prayers, a human chain was formed. Thousands of kilometres apart yet close in their hearts as afternoon prayers at Aljaamia Uthmania Mosque are observed outside a revered silence. Organisers have a simple, yet powerful message. “To be more tolerant of each other and to have respect for the different religions and to have respect for the diversity as well,” says organiser Claudia Groenmeyer. Members of different faiths came to show their support. “For the people in the community we don’t always see the difference, to us we are all family we are all together, and I think it’s important for us to make clear statements about what we believe by embodying that which we believe,” says Father Shaun Cozett of Bonteheuwel Anglican Church. But Bonteheuwel faces its own form of terror which is unabated gang violence is holding an entire community hostage. “Along all faiths, creeds, religion and social status people have come out over the last couple of days and showed solidarity. We also remember the atrocities that happen in Bonteheuwel itself where people are killed on a daily basis, and this has just brought it closer to home and we feel that we would show solidarity to New Zealand because there’s nothing else that we can do but we can also remember the atrocities that happen right on our doorstep,” says Bonteheuwel Joint Peace Forum’s Nadia Mayman. This entry was posted on 22 Mar 2019,08:13PM at 8:13 PM and is filed under South Africa, News, Homepage Featured Story Slider. You can follow any responses to this entry through the RSS 2.0 feed. Both comments and pings are currently closed.